SwanScript is a revised/renamed edition of SwanBot which was written for much older mIRC versions. 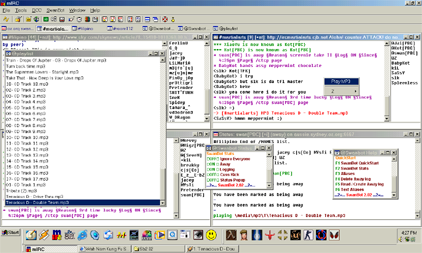 It has customised operator usage on the oz.org irc network. It has basic away & log functions, but a nice mp3 user interface. SwanScript can also sync play mp3s with your friends that are also running SwanScript (if they have the same mp3 in their mp3 search path). If you want your friend to listen to the same mp3 when you listen to it, dcc send the mp3 to them and/or make sure they have it in the same directory they set for their mp3 search path. All you need to do next is play a mp3 with ctcp mp3 notify. mIRC v6.01 (testbed) or later. A media player like Winamp. Also an unzip utilty like Winzip. download and extract contents to any directory. Copy over mirc.exe and mirc.hlp. Do not delete your PLS playlist, SwanScript will load titles from this file if they exist for that mp3. You can generate a PLS file from winamp. NB: You dont need a playlist, and can use console commands to play a mp3. SwanBot->Setup->MP3->Select player, then browse to your media player, eg. winamp.exe. SwanBot->Setup->MP3->MP3 search path, to set a default directory for file search. You can now play mp3s via command line. SwanBot->Setup->MP3->Load PLS playlist, then browse to your PLS file saved from Winamp. You can now play mp3s via the playlist window. This means no mp3 ctcp request will be sent out via mIRC. The mp3 will play in your choosen player, and others will not be notified. From the SwanBot menu direct to; SwanBot->Show playlist, will bring up the playlist window, after selecting your choice from the playlist, direct to; SwanBot->Play MP3, your media player will load your selected mp3. This means a mp3 ctcp request will be sent to the recipient of your highlighted window. The mp3 will play in your choosen player, and others will be notified (some people do not like the idea of being notified via ctcp). If a notified user is also running SwanScript the mp3 found in there default mp3 search directory will begin playing. From the SwanBot menu direct to; SwanBot->Show playlist, will bring up the playlist window, after selecting your choice from the playlist, direct to; [ channel | nick ] window->Play MP3, your media player will load your selected mp3, and a ctcp MP3 request will be sent. /playlist Will show your playlist window (req. for /pl & /plist). /plist Will play mp3 selected in playlist window. /mp "mp3 filename" Will play mp3 in argument with ctcp mp3 request. /mplay "mp3 filename" Will play mp3 in argument.